Discussion in 'Approved Species Profiles' started by Gian Greydragon, Mar 31, 2019. 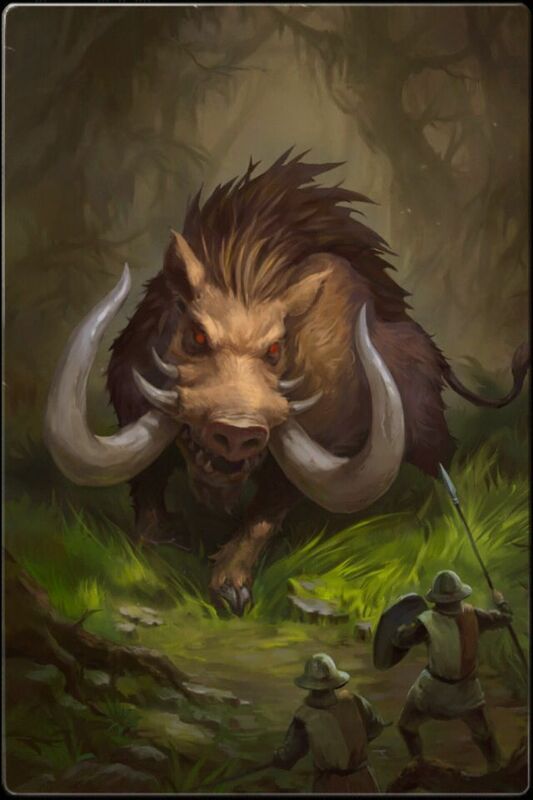 Sows (females) are typically smaller than the males, and almost physically identical to males, although typically more lean, and sport shorter, more blunted tusks, as well as a denser skull, meant to be used as a ram, though, they can also charge roughly 12 kilometers per hour more than their male counterparts, and can bludgeon armor beyond repair if their young are threatened. Boar piglets are born roughly half a meter in size, and depend entirely on their mother and father for protection. Have you been playing some AC Odyssey (Kalydonian Boar)? Anyhow, while the description is a bit light in some areas, this is nothing outlandish. Approved.